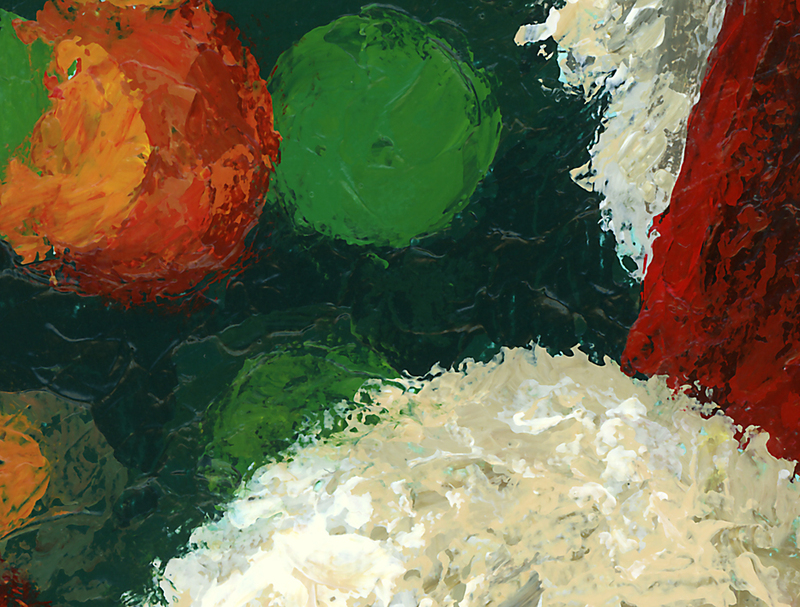 I’ve been having fun with these little paintings and finished this one early Christmas Eve day. The mask featured is a Carnival joker mask that I added to my collection a couple weeks ago. I have a feeling he’s going to show up in several of my paintings before it’s over with. As with my previous small canvasses, this painting was created using my palette knife on top of a black gesso base. Don’t worry, I’m not getting stuck in a mini-canvas rut, there are still some larger paintings in the works, one of which should be done early next year. At the risk of everyone getting sick of me going on and on about my beloved children I thought I’d share their reactions to receiving their Christmas portraits. I am glad to report they were a huge success. Christina had to immediately come and hug me. Eric kept talking about how cool they were. And, Donald loved the attitude I captured in his. I think their mom got as much of a kick out of their reactions as I did. Here are photos of each of them with their gift. Christina shares the moment with her dad. Eric wearing his new denim jacket celebrates receiving his portrait. Donald III reacts to his new portrait. 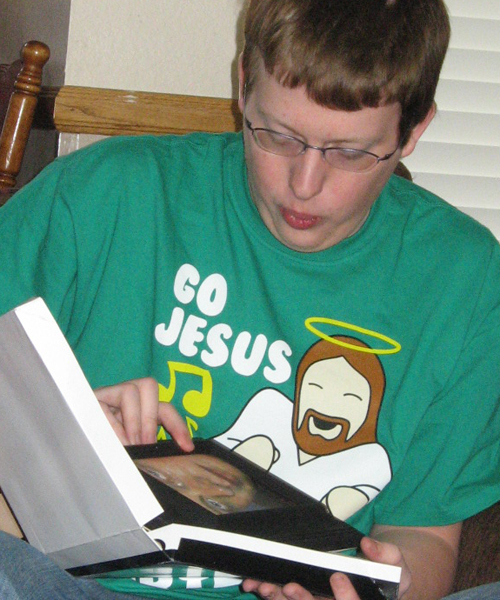 The shirt he’s wearing was a Christmas gift from his girlfriend which says “Go Jesus, It’s your birthday”. 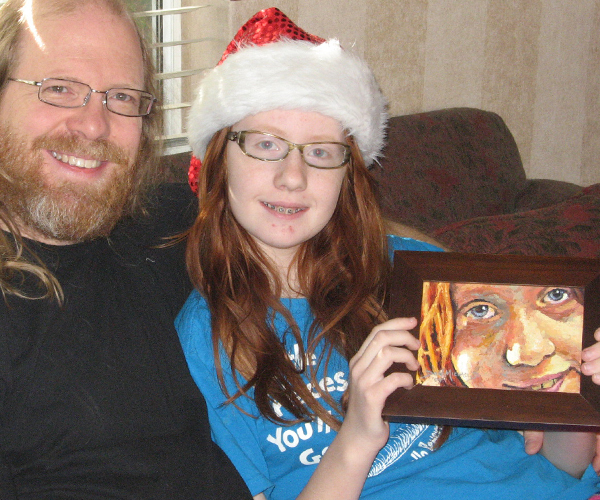 Last week I posted a painting I did of my 11 year-old daughter,”Christina“, which I plan to give her today for Christmas. I knew that Christina did not read my blog or my Facebook page so I could get by with posting it. This is not the case with her two brothers. I could not even let on that I was doing their portraits for fear they’d find out. So, since it’s now Christmas – just after midnight – and they will be opening their gifts in just a few short hours I thought I’d share the portraits I did of them. Eric, our middle child, will turning 16 in January. It all happens too fast, one minute you’re carrying them around in your arms and the next they are learning to drive! Eric is one of the most easy-going people you’ll ever meet. He is super-intelligent and has the ability to absorb information like a sponge. His passion is Rock-n-Roll – specifically anything Metal. 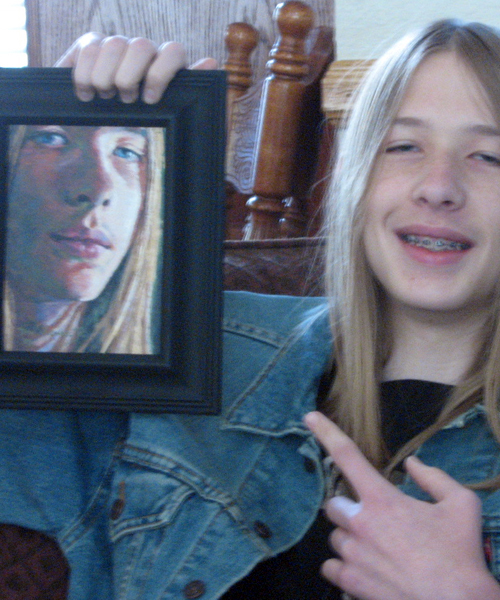 In his portrait I wanted to feature his long hair as much as his handsome face. It’s something he’s really proud of and it’s a joy to see him windmilling it when we’re at a concert together. When he and his friends part ways, whether it be after school or visiting, their parting words are “Peace Out”. 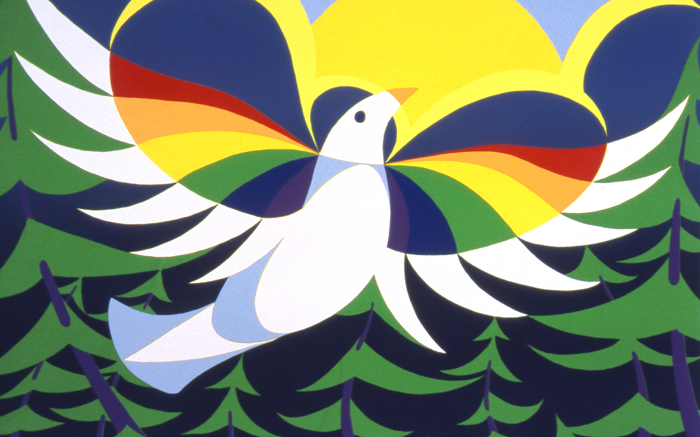 Peace Out – 7″x5″ – Acrylic on canvas – Completed 12-17-09 – ©2009, Don Michael, Jr.
Our oldest child is Donald III. He now goes by Don, but he’ll always be Donald or “D3″ to me. He turns 22 in January… yikes!!! I am considered a tall man at 6’4” but I have to look up to my boy who has me by an inch. Obviously, this is something he takes great pride in. Don is a good guy, with a big heart, but he’s also our stubborn one. What’s funny is he’s just like his mom in this and some of the most outrageous head-butting goes on between them – often they’re both saying the same thing, just differently. He’ll be home later this morning for Christmas breakfast and I cannot wait to see him. 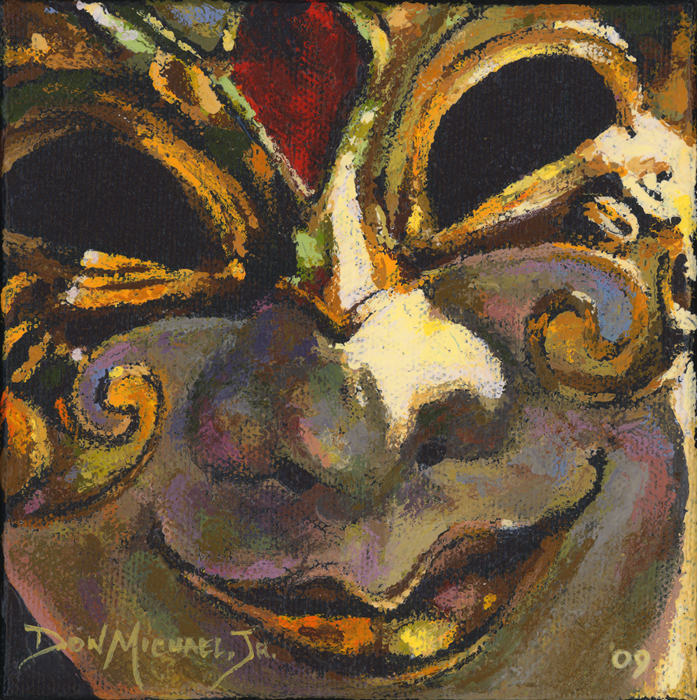 D3 – 7″x5″ – Acrylic on canvas – Completed 12-21-09 – ©2009, Don Michael, Jr. Both of these were painted using my trusty palette knife. I used a totally different palette on each as I continue to experiment with new colors and color combinations. I hope everyone has a Merry Christmas. God bless us, every one! As I mentioned in my previous post I decided to experiment with using my palette knife on smaller and smaller canvasses with the intent of finding the threshold at which it no longer holds up. I was successful at making it work on three 5″x7″ canvasses over the past few days and decided it was time to go even smaller. 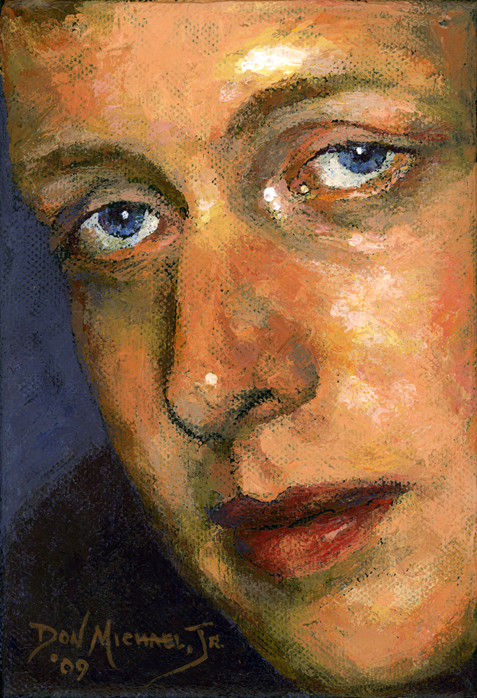 To continue with my experimental theme I used two colors new to me – Azo Yellow Medium and Hookers Green – in tandem with a couple of favorites – Pyrrole Red and Phthalocyanine Blue. Those colors with Titanium White make up the entire palette. Once again I started the painting by priming the canvas with Black Gesso. I really enjoy how the black peeks thru throughout the entire canvas reinforcing the textural nature of the paint being applied with the knife. Meanwhile I’ve been experimenting with new ideas for the next major piece which will involve actual masks in the composition – similar to what I did with “Shadow of a Doubt“. I’m really excited about where I’m going with it, but anticipate it being a couple weeks before it comes to fruition. 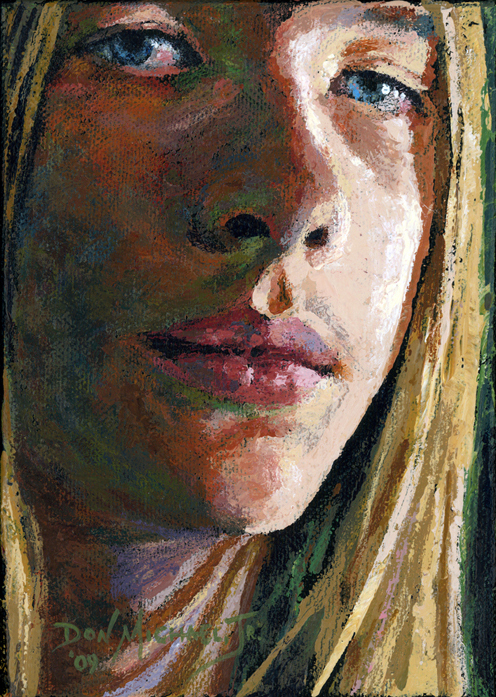 I’m also experimenting with some smaller canvases – the smallest being 4″x5”. 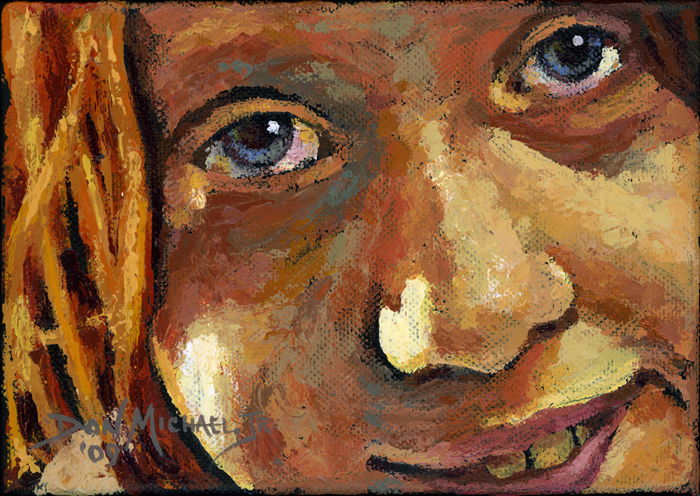 I’d had so much fun painting my daughter’s portrait on a 5″x7″ canvas with a palette knife I thought I’d see how small I could go before the palette knife becomes a liability. I hope to have a few of them ready to show later this week. In the midst of all this, my family and I have been caught up in all the excitement that comes with the Christmas season. We’ve had several parties to attend over the past few days where we enjoyed the company of old friends while making new ones. It’s hard to believe that Christmas is this Friday! Where has 2009 gone?!?!?!? Since I have mentioned my family so much in my blogs I thought I’d introduce you to one of them. I’d like you to meet my daughter, Christina, who keeps her mom and I on our toes. This girl does not miss a thing. She has a tenacity and a wit about her that sometimes makes my hair curl. To go with that she has one of the biggest, kindest, most gentle hearts in the world. Her observation skills totally floor me sometimes, and I can always count on an honest, yet loving, opinion of whatever painting is on the easel. As soon as she was born and I saw her beautiful new-penny colored red hair I started calling her “My Little Coppertop”. A friend of ours loved this nickname so much she had those words embroidered – in copper – on a beautiful white baby blanket. This is the smallest canvas I’ve painted on in nearly three decades. I started with black gesso as my base coat and using my trusty palette knife got busy applying the paint. I was wondering if the palette knife would work on such small scale and was pleasantly surprised that it all held together pretty well. It probably helped that I did not texture my base coat at all on this one. Any texturing came with the application of paint. I had so much fun that I imagine more of these will be coming in the future. My new challenge will be seeing if I can keep Christina from seeing this before Christmas. If so, it will be wrapped up and waiting for her Christmas morning. “Mele Kalikimaka is the thing to say on a bright Hawaiian Christmas Day. That’s the island greeting that we send to you from the land where palm trees sway…” At least, that’s what Bing Crosby sang to the world with the Andrews Sisters back in 1950 when I was still just a twinkle in my father’s eye. That song has warmed me on many a cold December evening as the holidays unfold each year. 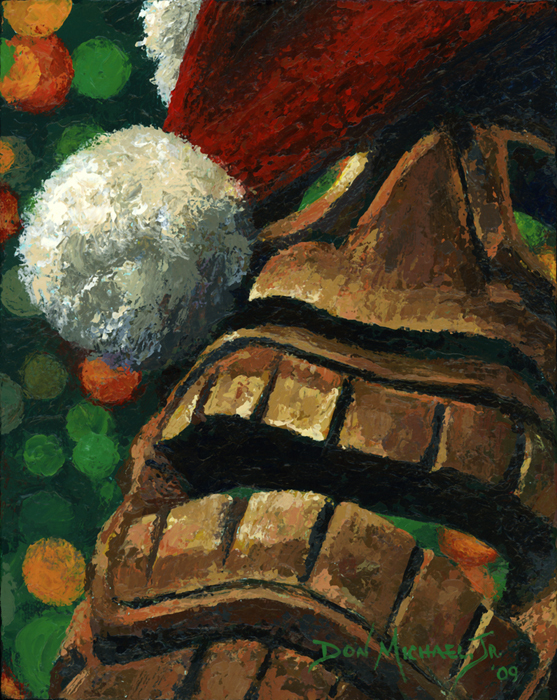 “Mele Kalikimaka” is being donated to the From Barb with Love Project charity art auction which will take place 7:30 this Saturday night, December 12, at the Arts Factory, Suite 215, here in Las Vegas. Proceeds will go to fill paper bags with items, like food and tooth brushes, to be passed out to homeless who hang out at intersections throughout Las Vegas asking for assistance. It’s a beautiful project started this past year by Cheryl Slader, owner of Blue Sky Yoga in Las Vegas, in memory of her good friend Barb, a multi-talented young woman of generous spirit who left this earth much too early. Artwork from several other area artists will be included in the auction as well. I will have a few other paintings on display at the event of which 25% of any sales will go to the charity. As a fun bonus, I thought I’d include a mega-blown-up detail of my knife work. Be sure to click on it to see the all the globs and smears, as well as touches of the pale blue-green undercoat peeking thru. 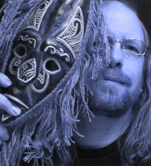 For a change of pace I decided to include an actual mask in one of my compositions. 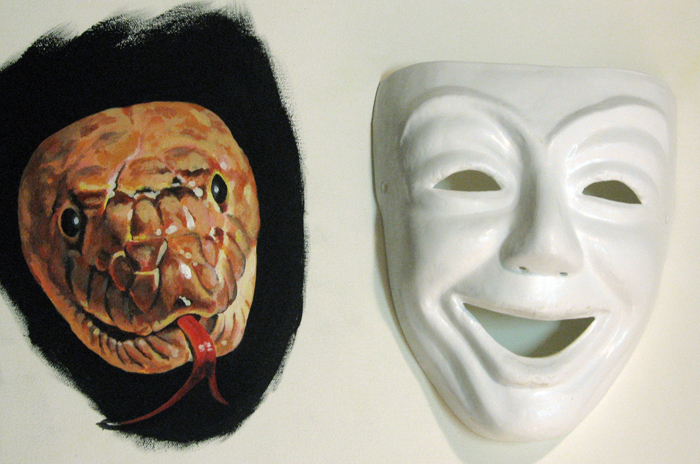 I had never included eyes behind a mask in any of my paintings and thought this would be the perfect opportunity to do so. To start this project I took a paper mache’ mask and carved its back down so it would lay flat. On the canvas I blocked out where I would attach the mask and then painted a face with wide-open, slightly freaked-out eyes. 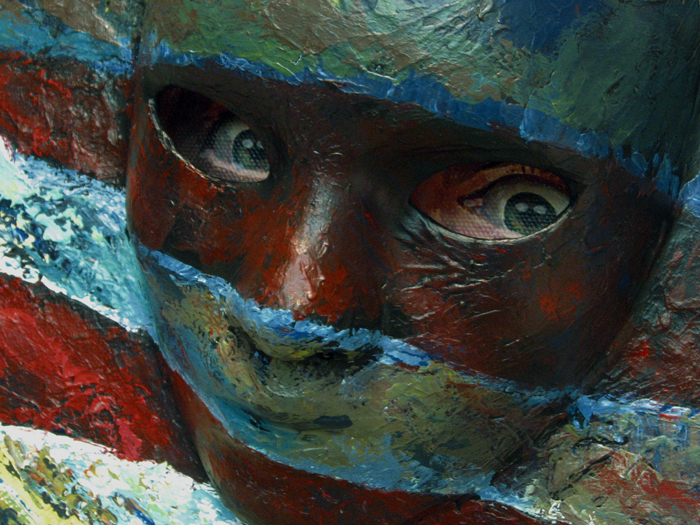 Using strips of archival paper and acrylic medium I then adhered the mask to the canvas. To cover the seams and give the whole piece a unified texture I applied molding paste to the entire surface. I carved a slit in the top of the mask to allow light to enter from above to help illuminate the eyes. Up to this point everything had gone smoothly and I was really having a blast trying out some new stuff. My only regret was that in all my fun creating I forgot to photograph my progress – specifically the face which is now mostly hidden by the mask. 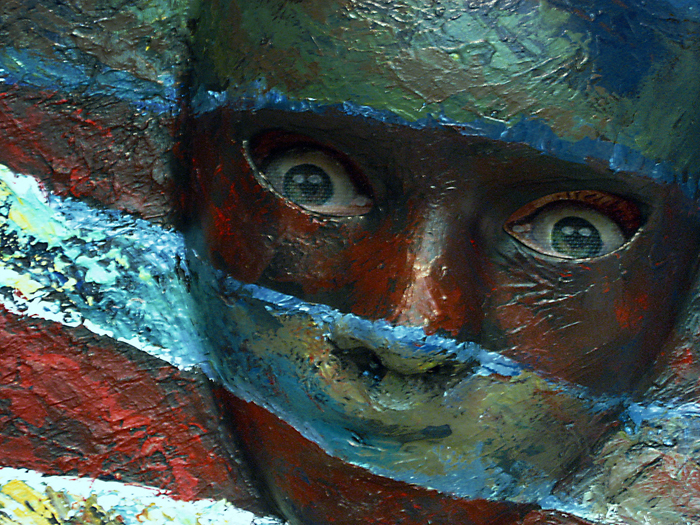 My original vision had me painting a certain subject matter across the rest of the canvas and the mask using a brush. Well, I HATED the results. So, thinking maybe I was just missing my usual thick texturing, I painted the same subject matter over the top using my palette knife… I then HATED it even more!!! After those first two failures I put the whole project aside pending an epiphany. One night, with still no clear solution in sight, I decided that I HATED what I’d done to that point so badly that I just painted black gesso over everything except the face hidden behind the mask. From that clean slate inspiration finally reared its lovely head at which point I got so excited that I started slinging paint from all corners of the room using my palette knife, my fingers and even paper towels. Somehow, I even ended up with paint all over my face… which is a clear indicator that fun times were finally back on the menu! A wonderful anomaly that I observed during the process of this creation is that the eyes literally follow you everywhere. 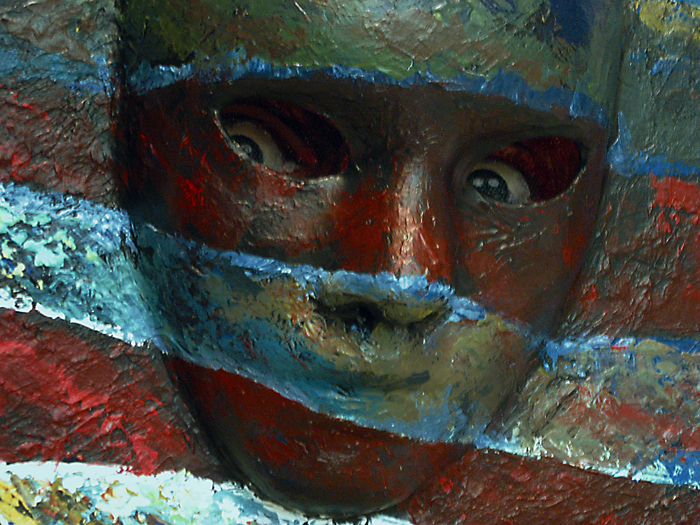 Even though I painted them staring straight out, once the 3D nature of the mask was placed in front of them it felt like they moved from side to side and top to bottom as I moved around the canvas. I’ve attempted to catch this phenomenon in the following photos. 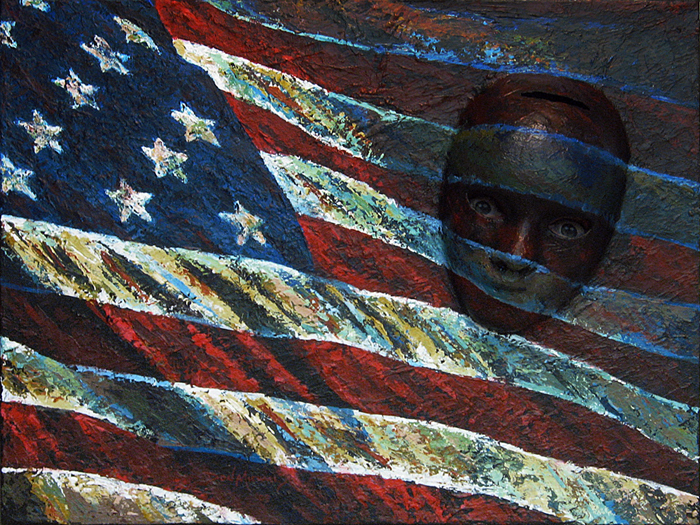 I thought of Jasper Johns as I was painting the flag and suddenly realized that I had already inadvertently tipped my hat to him with the inclusion of the 3D face in this work. My intent was totally different, but it caused me to wonder, “Is there anything left out there that hasn’t been done already?”. As for this painting, I have decided to let it speak for itself. I would love to hear what it says to you. As we enter into this holiday season I would like to remind everyone to not let the self-induced, familial, and media driven stresses get you down. Find yourself a peaceful place – internally and externally – and let the breeze of stress just blow right past you. Christmas is supposed to be a time of hope and peace… a time for joy and tranquility… a time to enjoy the company of family and friends… a time to reflect on the blessings we have in our lives. Keep these thoughts in mind as the media inundates us with “must-have” items while they try to whip us into a spending frenzy. Some of us have dealt with the loss of loved ones during holiday seasons past. Instead of reflecting on the loss and the emptiness that comes with it, I challenge each of us to focus on the wonderful impact these loved ones had on our lives. Let’s all make this a stress free, depression free, totally angst free month of December 2009. 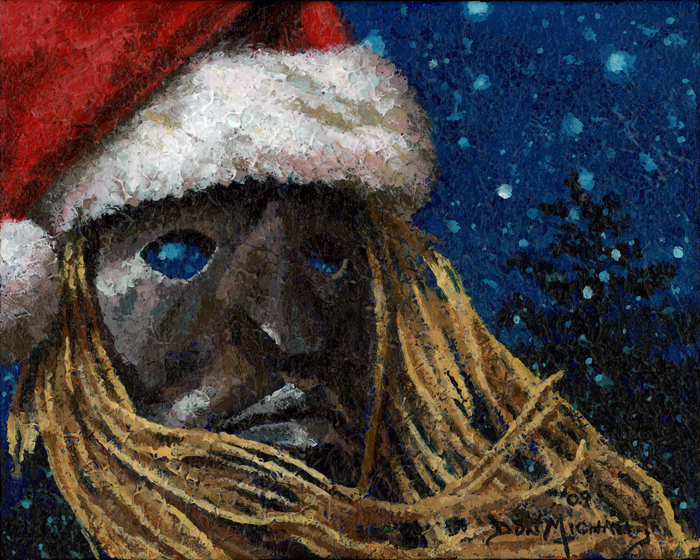 So, to start my December 2009 with some fun, I placed my daughter’s santa hat upon my favorite mask – which comes from Marmaris, Turkey – and got busy. The undercoat on this one is molding paste mixed with phthalocyanine blue applied with my trusty palette knife and textured with a natural sponge. 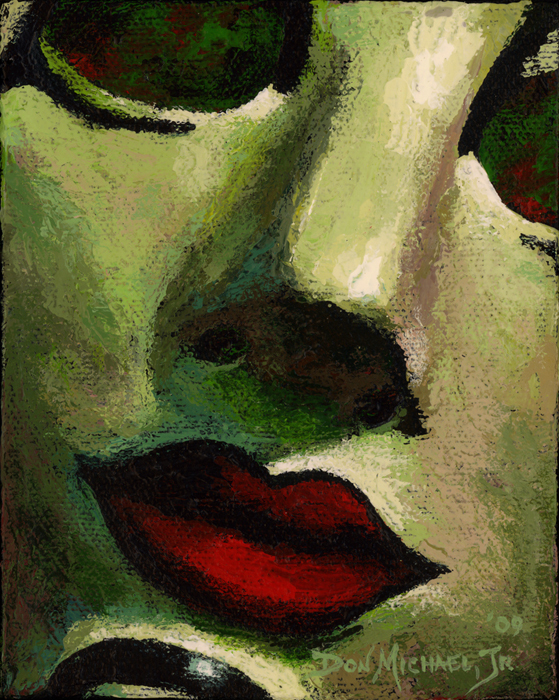 The intensity of the texture required me to use brushes to apply the paint for the duration of this one. It was too deep for my palette knife to function against properly.